JPMorgan Chase CEO Jamie Dimon, the best paid bank CEO in 2011, according to rankings released Wednesday. NEW YORK (CNNMoney) -- JPMorgan Chase CEO Jamie Dimon ranks first in pay for bank CEOs -- at least for the time being. Analysis of bank proxy statements by research firm SNL Financial found Dimon's 2011 compensation package of $23.1 million tops among bank CEOs. His package was up 11% from 2010, when he was No. 2 in the pay rankings with $20.8 million in total compensation. No. 2 on the list this year was John Stumpf, CEO of Wells Fargo (WFC, Fortune 500), whose pay package came in at $19.8 million. Stumpf's base pay of $2.8 million doubled Dimon's base pay. But Dimon took home stock and option awards valued at $17 million, far above the $12 million Stumpf received from those sources. However, it's not clear though that Dimon will be able to hang onto all that pay and his No. 1 rank. Dimon and his bank have come under fire since that pay package was first reported after JPMorgan (JPM, Fortune 500) disclosed a trading loss of at least $2 billion. Dimon testified about the loss before both Senate and House committees in the last two weeks, saying that the bank had no defense for the loss. He also disclosed that it is likely the bank will seek a return of some of the pay given to executives responsible for the losses, a process known as a clawback. Asked during his testimony Tuesday before the House Financial Services Committee whether a clawback of his own pay was possible, Dimon said it was. 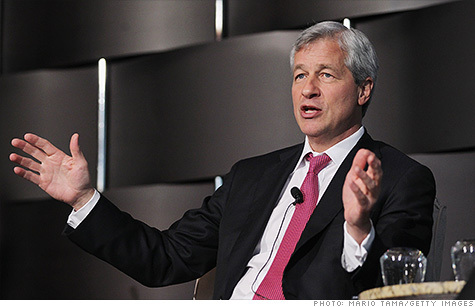 "This whole action would be reviewed by the board," Dimon said. "My compensation is 100% up to my board. They will do what they see is appropriate. I can't tell my board what to do." JPMorgan shareholders voted by about a 9-to-1 margin to approve executive pay packages at the bank at this year's annual meeting, although most votes were cast before the trading loss was disclosed. JPMorgan Chase is the nation's largest bank by assets. But Dimon's 2011 package was more than what was received by the chiefs of the next two largest banks combined -- No. 2 Bank of America (BAC, Fortune 500), where CEO Brian Moynihan received $8.1 million, and No. 3 Citigroup (C, Fortune 500), where CEO Vikram Pandit received $14.9 million. Those packages put Pandit No. 3 on SNL's pay rankings, while Moynihan was No. 4. Still, it's not just the nation's largest banks whose CEOs are bringing home big pay packages. Even among banks with less than $1 billion in assets there were three with CEOs whose pay packages topped $1 million. Only one bank CEO whose bank had more than $10 billion in assets paid its CEO a package estimated at less than $1 million. That $855,155 package went to Aurelio Alemán-Bermúdez, CEO of Puerto Rico-based First BanCorp (FBP). First BanCorp has assets of $13 billion, according to SNL, compared to $2.3 trillion at JPMorgan Chase. Two CEOs of relatively small banks -- Joseph Bouffard of the holding company for Baltimore County Savings Bank (BCSB), and Clayton Talbert of Homeland Community Bank (HCTN) in McMinnville, Tenn. -- were listed as receiving zero compensation for 2011. There were only six other bank CEOs whose pay package was valued under $100,000.